shine brite zamorano: 3d teddy. I just met with the 4th graders again. Their first 2 week rotation focused on using contour line to describe shapes. This lesson had them using value and color contrast to define edges of shapes. I recently found out about the work of Teodoru Badiu. He is a designer and artist based in Vienna, Austria. 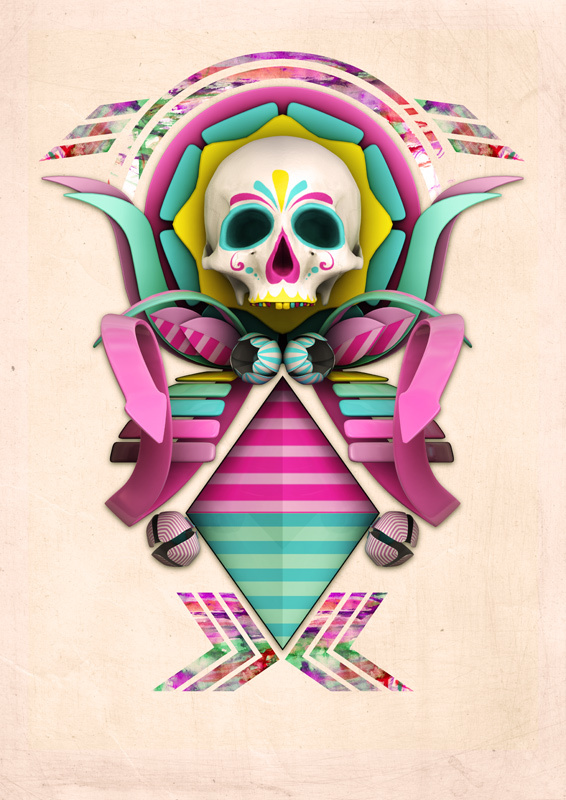 He creates most of his images digitally using programs like photoshop, illustrator, and cinema 4d. His visual vocabulary is quite diverse and has created many surreal visual worlds and characters. When I introduced the students to Teodoru's work I used images from one of his websites. The kids LOVED the characters they saw. 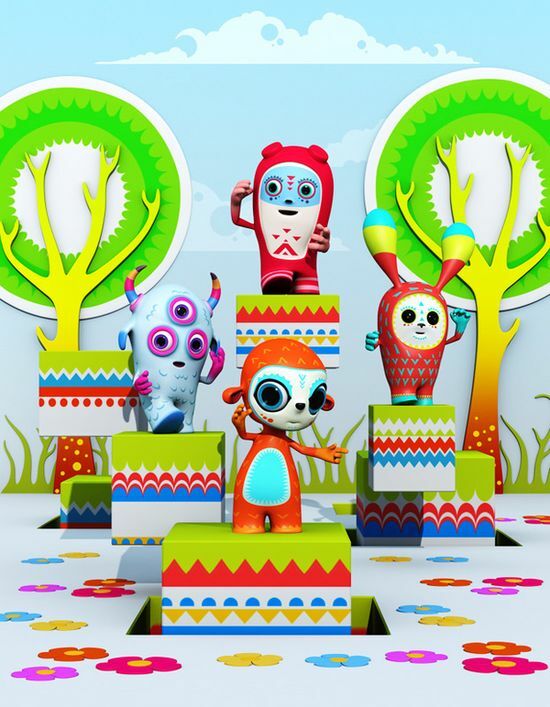 We talked about the fact that Teodoru makes these characters look like they could be real (or at least made out of clay) by using color contrast to define the edges of objects (no outlines!) and by using tints and shades to define their volume. 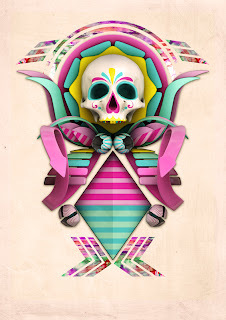 The image that we focused on was one that was inspired by the Mexican holiday of the Day of the Dead. We talked briefly about what the holiday was about and then revisited what made the image look 3d. While viewing the image we also identified the symmetry running through every part of the composition. Symmetry creates unity in a design and it also tends to focus the viewer's attention down the line of symmetry. This art project involved a lot of folding, cutting, and gluing. Students folded each layer before cutting to reinforce the symmetry of their design. We designed the skull first. I talked about and demonstrated what each of the bumps were on our head. After cutting out e skull, students added shading with a black crayon to it look more 3d and added a symmetrical crayon design to it. Students then cut the middle and back layers, tucking each layer into the fold of the previous layer to make sure each was big enough. All 3 layers were then glued to the background sheet. Since Teodoru's design uses multicolored shapes at the top I decided this would be a good opportunity to use the tie dye paper that I had gotten earlier in the year. These are pre-printed 8.5x11 sheets that come in a variety pack. This created variety in their individual designs and also created it across classes for exhibition purposes. Students cut and applied this paper into large and small shapes to add a variety of positive shapes to the background negative shape. Different classes had different background colors. There are ones with red backgrounds that are not pictured yet. I chose white for the first class and they did an amazing job constructing their designs, but I do like the ones on darker colored backgrounds more. The skull and other parts really vibrate against the darker colors. This is one of my favorite multicultural subjects to teach. I had never see any of Teodoru Badiu's work and am glad you introduced him to all of us bloggers. I teach K-5 but only do Day of the Dead projects with 2-5 (scare factor, ya know? )I will look forward to adding this artist to my resource file. Thanks!